Has anyone in Official Washington thought through the latest foreign policy "group think," the plan to destabilize nuclear-armed Russia? All the "smart" people, including the New York Times editors, are rubbing their hands with glee over the financial crisis being imposed on Russia because of the Ukraine crisis, but no one, it seems, is looking down the road. This reckless strategy appears to be another neocon-driven "regime change" scheme, this time focused on Moscow with the goal to take down Russian President Vladimir Putin and presumably replace him with some U.S. puppet, a Russian-speaking Ahmed Chalabi perhaps. Since the neocons have never faced accountability for the Iraq disaster -- when the conniving Chalabi was their man -- they are still free to dream about a replay in Russia. However, as catastrophic as the Iraq War was especially for Iraqis, the new neocon goal of Russian "regime change" is far more dangerous. If one looks at the chaos that has followed neocon (and "liberal interventionist") schemes to overthrow governments in Iraq, Syria, Libya, Ukraine and elsewhere, what might the risks be if such political disorder was created in Russia? Since the neocon plans don't always work out precisely as they dream them up at Washington think tanks or at the Washington Post's editorial board, what are the chances that some radical Russian nationalist might emerge from the chaos and take command of the nuclear launch codes? As much fun as the Washington tough guys and gals are having today, the prospects for thermo-nuclear war might not be as pleasing. And, does anyone really think that cooler heads in Official Washington would prevail in such a crisis? From what we have seen over the past year regarding Ukraine -- not to mention other international hot spots -- it seems that the only game in town is to swagger around, as pumped up as Hans and Franz, just not as amusing. You see, the Russians have already experienced what it is like to comply with U.S. economic edicts. That was tried during the 1990s after the collapse of the Soviet Union when experts from Harvard University descended on Moscow with "shock therapy" for the post-communist society. What happened was that a handful of well-connected thieves plundered the nation's resources, making themselves into billionaire oligarchs while President Boris Yeltsin stayed drunk much of the time and many average Russians faced starvation. So, even a "successful regime change" could end up with a more radical figure in charge of Russia and its nuclear arsenal than Putin. But that is the course that Official Washington has chosen to take, with Congress almost unanimously approving a package of harsher sanctions and $350 million in arms and military equipment for Ukraine to wage its "anti-terrorism operation" against ethnic Russians in eastern Ukraine. There is some irony here in that just as President Barack Obama finally begins to lift the ineffective, half-century-old U.S. embargo against Cuba, the U.S. Congress and the entire mainstream U.S. news media have jumped on another high horse to charge off against Russia, imposing new economic sanctions and dreaming of another "regime change." The promiscuous use of sanctions -- as part of "regime change" strategies -- has become almost an addiction in Washington. One can envision some tough-talking U.S. diplomat confronting the leaders of a troublesome nation by going around the room and saying, "we sanction you, we sanction you, we sanction you." Beyond the trouble that this pathology creates for American businesses, not sure whether they're stumbling over one of these sanctions, there is the backlash among countries increasingly trying to circumvent the United States in order to deny Washington that leverage over them. The long-run effect is surely to be a weakening of the U.S. dollar and the U.S. economy. However, in the meantime, U.S. politicians can't seem to get enough of this feel-good approach to foreign disputes. 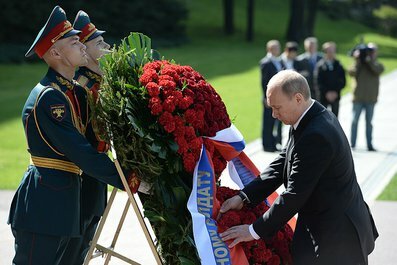 They can act like they're "doing something" by punishing the people of some wayward country, but sanctions are still short of outright war, so the politicians don't have to attend funerals and face distraught mothers and fathers, at least not the mothers and fathers of American soldiers.